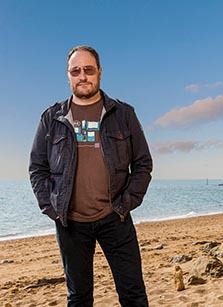 Dr Who, Life on Mars, Torchwood: Bridport writer Chris Chibnall may have started his career as a football archivist for Sky Sports, but between that and Broadchurch there has been a lot of work. Katherine Locke talks to him about his life before and after his move to Bridport. Picture this: an emerging young playwright trying to write in the sitting room on the tenth floor of a tower block in King’s Cross, who suddenly had the thought that there might be a better way. ‘Our son was a baby and had taken over the second bedroom, which had been my writing room’, says Chris Chibnall, ‘suddenly I was left with a corner to work in and a very busy flat’. At this point, Chris’s writing career was beginning to get interesting. After studying Drama at St Mary’s University College and subsequently an MA in Theatre and Film from Sheffield University, he had found his voice writing for the stage. Although he began his career as a football archivist for Sky Sports, he quickly found his way back to his first love of writing. After a series of administrative roles within the theatre, he went on to become Writer in Residence for GRiP, writing three full length plays during this period. His year long attachment to Soho Theatre resulted in the play Kiss Me Like You Mean It which was very well received and shortlisted for the Meyer-Whitworth Prize. It wasn’t until around 2000 that he started to write for television. Already well established as a young scriptwriter to watch, his first television play Stormin’ Norman starring James Bolan, was a great success. That was followed by Born and Bred, which ran on BBC One for four years. He then went on to work on the BAFTA award winning series Life on Mars as well as Torchwood—the Dr Who spin off—also writing scripts for Dr Who itself including the notable Episode 42. With his television script writing career taking off, he and his wife Madeleine, decided enough of London was enough and decided to take the brave step out into the countryside. Chris spent much of his childhood moving around the North East, but he wasn’t interested in going back or rediscovering his roots. ‘I liked the challenge and idea of something new’, he says. ‘We could have gone anywhere’, says Chris, ‘we looked at the Peak District, and several other places’, but it was when the couple stayed in Lyme Regis for New Year’s Eve that they started to consider Dorset. ‘We were staying in the pink house on Marine Parade and woke up every morning to the sound of the sea and the most beautiful, stunning light. ‘As soon as the shops opened after New Year, we went scouting around estate agents looking for properties’. After some searching, their first house in Bridport was purchased and Chris was knuckling down to the serious business of television script writing. It may appear glamorous, but actually requires hours of intense concentration and very hard work. It is impossible to talk to Chris about his work and Dorset, without the conversation turning to Broadchurch. The television series broke so many records that they hard to list. Series One was watched by 9.1m viewers and was nominated for no less than seven BAFTA Awards and won in several categories, including Best New Drama. The series went on to win a further seven national awards and was met with huge critical acclaim. Chris explains that it was unusual at the time to set a television series in a market town rather than a metropolitan backdrop. ‘Most of us live in small, market towns’, he says, ‘but they weren’t often seen on television’. He recalls a producer looking through a scene where a character walks down the street and passers-by say hello to him. ‘The producer said—well that would never happen—and I replied, try walking down Bridport high street with my wife’. Setting the series in the fictional small town of Broadchurch was integral to the structure of the plot. ‘I was interested in the intertwined nature of small towns and how tragedy can affect the whole community’, says Chris. Broadchurch also broke the mould with the length of the series. ‘It was almost unheard of to set a series over eight episodes’, explains Chris, ‘Six was the norm, but Broadchurch was unusual because it was long form writing, which meant we could spend much more time with each character’. Chris partially attributes this as the reason the series attracted such a strong cast of actors. ‘It gave the cast space to really explore and develop their character’, he says. When Jodie Whittaker (who plays Beth) read the script she felt the characters immediately resonated with her own experience ‘That’s just like my dad’, she said about one scene. The entire series drew on a cinematic format, rather than the traditional television drama style. ‘It was more visual and less stagey’, says Chris, ‘and of course, the landscape played a huge part in that’. Chris spends a lot of time walking around the local countryside. ‘Walking gives me space to think’, he says, ‘not just physical space, but also creative space’. He takes himself out whenever he hits a thorny writing problem that needs solving. ‘I think walking oxygenates the brain’, he says. Chris had the idea for Broadchurch whilst out on a walk—‘I’m almost embarrassed I didn’t think about it sooner’, he says. ‘There is an expression ‘take an idea for a walk’ and it has never been more apposite than in this case’. He wanted to set the murder mystery somewhere different and West Dorset became the obvious choice. His favourite walk is from his home in Bridport, down to West Bay and then left or right ‘however the mood takes me’, he says. The coastline has been described as another character inc the series and there is no doubt it looked stunning. He has just finished the script for the third series of Broadchurch and, true to form, the details are shrouded with secrecy. Having spent a long time researching and interviewing for the programme, he has revealed that filming should start around summer 2016. ‘You can ask me anything’, he says, ‘we have all got really good at concealment’. He will say that both David Tennant and Olivia Coleman will be starring again and there will be some of the same cast, but to expect new characters. Chris has a very special place in his heart for Dorset. ‘We could have gone anywhere, but now Bridport feels like home’, says Chris. ‘What started out as chance, turned into a happy accident. Bridport had changed my life’.